As I write this article, there’s a viral issue spreading in the various social networks about a folly committed by a government agency in its effort to portray what its officials are doing in the aftermath of Typhoon ‘Pedring’. In a photo release last Wednesday in Facebook, the Department of Public Works and Highways (DPWH) wanted to show their officials conducting field inspection after the onslaught of ‘Pedring’ but drew a barrage of criticisms for having been allegedly “Photoshopped”. 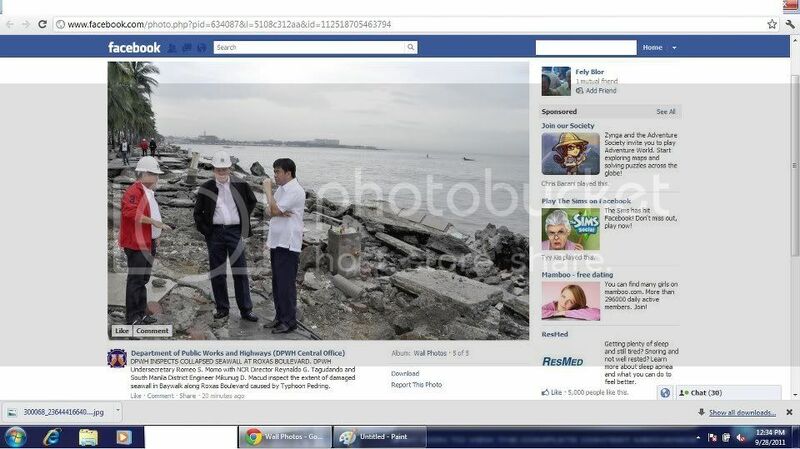 The photo, which had been pulled down from the Facebook account of the DPWH Central Office, showed DPWH Undersecretary Romeo Momo discussing Pedring’s damages with DPWH National Capital Region Director Reynaldo Tagudando and DPWH South Manila District Engineer Mikunug Macud along Roxas Boulevard. The photo made them appear to be standing over what was left of the seawall which shielded Roxas Boulevard from Manila Bay’s waves. But instead of being appreciated, the photo only gained disapproval from those who saw it, pointing out that the three officials seemed to be ‘floating’. Comments on the post criticized the DPWH for ‘faking’ the documentation of their work in order to make them look good to the public. Those who wrote comments also expected the department to apologize for the edited photo, stating that there was no need to even edit a photo if it truly showed officials hunkering down to work. DPWH public relations officer Andro Santiago told Inquirer.net over a phone interview that the photo had been posted by mistake as they were also preparing the layout for a magazine they circulated in the DPWH. He said the images of Momo, Tagudando and Macud had been cropped from a photo and laid on top of another photo to form the image which sparked criticism online. “It was a cropped photo (of the officials) showing them in another angle,” Santiago explained. He maintained that it was not the DPWH’s intention to fool the public by posting an edited photo of the inspection, adding that the minute they realized the mistake, they immediately replaced it with the official photo release. “Walang Photoshop at hindi naretoke” was his description of the official photo release. 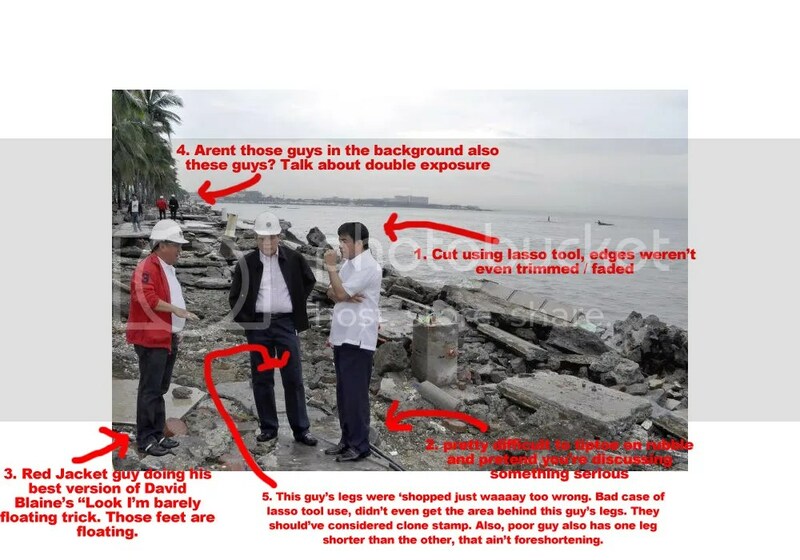 Contrary to Santiago’s claim, an article by Pierre Albert San Diego at Controlled Chaos published a day after DPWH posted the photo, clearly showed the various reasons to prove that the photo was indeed photoshopped. The article entitled “DPWH Photoshop Fail” started the netizens’ wrath against the line department notoriously known for graft and corruption in its turf. While some people may see this DPWH booboo as a harmless one but such is not the case for the many online commenters on the issue. If our government people could lie on a small thing like this, what would prevent them from taking on big ones? This incident, no matter what, should warrant some punishment on the perpetrators of the seemingly harmless crime.